I spent a lovely hour on Friday listening to Imtiaz Dharker, who visited Dixons Kings as part of the Ilkley Literature Festival. I came hoping for the cheat-sheet on Tissue, but I left her talk with a renewed love for poetry and especially for Tissue. Here are some of her words and some of my thoughts. Dharker explained the inspiration for Tissue – a note from her father in the back of the Quran. This was seen at the time when she and her father were out of touch and she hadn’t spoken to him for a long time. This “flimsy piece of paper” brought home to her that it is family and relationships that matter, not the structures we build, not bricks and mortar and stone. Tissue is “written like a love poem” to remember her father. The connections between the most precious and the flimsiest things is explored. Paper is precious and flimsy. Human connections are precious and flimsy. Tissue as a love poem is a wonderful lens to view it through. I ended one of my previous blogs with this sentence: “I have become a better teacher in recent years by trying to become a better English teacher”. This is definitely true, but in all honesty I have tended to try to get better at the things that interest me, or the things that are most obvious, such as teaching writing. I get excited about something like rhetoric and then direct all my energies into it, but some areas inevitably get neglected. I am now going to tackle those areas- not weaknesses as such, but subject knowledge gaps that I need to fill. I am currently writing a scheme of work on 19th Century Literature and once I started putting together a knowledge organiser I realised that a) I knew nothing about the century and b) fitting a whole century on a knowledge organiser is not a task that should necessarily be undertaken. So many holes in my knowledge were uncovered as I started. I didn’t know the first passenger trains were in 1825 for example. I didn’t know when the Crimean War was, or even the decades of important moments such as the abolition of slavery. To illustrate how problematic this lack of history is, imagine that we were studying “20th Century Literature.” We know instinctively how a book written in 1950 would be different to one in 1970, how one in 1912 would be different from 1920, but it is harder to understand how 1850 is different from 1870. Lumping everything together into the same 19th Century shaped box is not helpful. Dracula was published in 1897 and Frankenstein so much earlier in 1812, yet they are placed together in the same category of 19th Century Literature, with 85 years between them. To put this time gap in perspective, Tarzan and the Apes and The Lost World were published in 1912 while 1997 saw the publication Harry Potter and The Philosopher’s Stone. 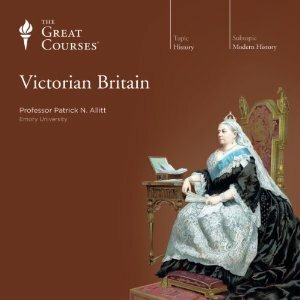 To try and combat this breadth of ignorance, I have been listening to one of the Great Courses on Victorian Britain on my commute this term. I imagined that this would be a bit of a chore but I absolutely love it. The course is 18 hours long and I’m about a third of the way through. It’s constantly surprising and endlessly fascinating. It is changing how I view history and how I consider the texts produced in that time- it will help my teaching of 19th Century Literature no end. No more will I just say, “they were very religious in those days” as a catch-all statement about context for virtually any text before 1950. I know my grammar fairly well, but looking at the list of terminology that students in year 6 are expected to learn, I know that I couldn’t explain them easily to a novice. I think this is sometimes the case for teachers. We know our stuff, but teaching that stuff is another thing entirely. Even seemingly simple terminology such as ‘verb’ is much more complex than “It’s a doing word”. Mark-schemes for AQA mention ‘sentence functions’- easy to understand but quite difficult to get students to comment on effectively. I need to improve some of my knowledge of, and all of my teaching of, grammar. So the question is how do I get to the point where I am a grammar expert? The answer to this one- as it often is for me- is reading. 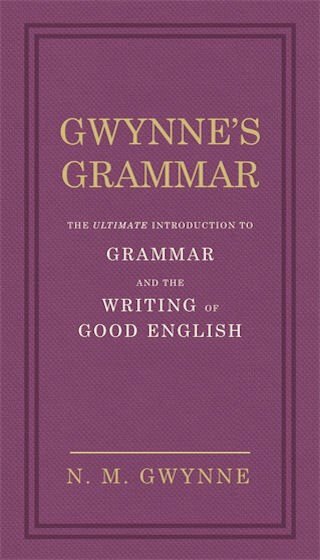 Gwynne’s Grammar is the guide that I have chosen to read. However, I have owned this since 2013 and not read a word, so that might be easier said than done. I’m going to read 5 pages a day, starting today. By putting it in writing on this blog, at least my 63 readers will hold me to account. I am delighted to see the back of controlled assessment and I am already enjoying teaching new specifications. But the unfamiliarity can be a problem. I have brought myself up to speed with specifications and examinations, but there are always nuances that are not apparent until you start teaching, and sometimes only after you have taught it through. We have started teaching poems from the AQA Power and Conflict cluster and I have made sure that I am very familiar with every poem that I have taught, but I don’t yet know all of the poems that I will be teaching later on in the school year. At first I wasn’t so concerned about this, but it has become apparent to me that an overview of the whole selection of poems would make teaching each individual poem easier- for me and the students. Common patterns across the poems- themes, viewpoints, language techniques- have been discovered almost by accident, and a more thorough understanding of the whole body of poems would have meant that sequences were designed around this, rather than spotting them when they come up. This is my holiday reading for my two weeks off in October- a poem a day. All of these things at first seem to me like the least exciting parts of being an English teacher: specifications, history and grammar. Yet reading some of the best poetry ever written, finding out about a century that shaped modern Britain and becoming more accomplished at the mechanics of language should never be described as ‘least exciting’, should they? A couple of weeks ago I wrote about how we practised classroom routines at DKA in order to ensure consistency. With similar behaviours and routines used across the school, it is just much easier to teach. Does this mean that everyone is expected to teach in an identical way, or that individual needs are not important? Of course not. That is why the CPD programme that we have developed is not built solely around the school’s development needs, but with the individual teacher in mind. It is incredibly difficult to make CPD highly personalised, but I believe that we have a system that works, where every single teacher in the school gets the specific personal development that they need. Here’s what we do. No single small step will dramatically change a classroom in and of itself. Multiple small changes, though, implemented week after week, add up to extraordinary change. The low stakes, supportive nature of this is crucial in it being used as a development tool- nobody needs to worry about judgement or grading. Coaching meetings will often include some practice, so improvements can be embedded. Emma Hickey, head of MFL at Dixons Kings Academy, has written about the benefits of coaching here and Harry Fletcher-Wood has an excellent series of posts which explore leverage observations at length. Of course, just because someone is a head of department, it doesn’t mean that they don’t need to focus on improving teaching too. And just because someone isn’t in a leadership position, it doesn’t mean that they are less experienced. So, even within this model, we need to be conscious of the fact that there are wide differences between teachers. This is why we will have more than one session every Monday and many Tuesdays. These sessions will be created based on what we learn from staff voice, coaching etc as the term goes on. We also have induction sessions for new staff and weekly Teach First sessions, plus meetings of steering groups such as department literacy reps in the example above. Having noted all of this, it is still difficult- if not impossible- to pitch a session just right so that everyone gets exactly what they need. You could have just two people in a session and not be able to pitch it right. That’s why we always ask- what’s in it for everyone? One of the best ways that this can be done is to allow staff to reflect, to plan, and to consider what they will do for their own classes. For example, this week we looked at some strategies to help with behaviour management. Time was given for staff to plan exactly which strategies would work best with particular students, even scripting what they might say to specific students to get them back on track. The previous week, after a brief presentation on differentiation and feedback, teachers were given most of the session to plan. (They were also able to leave if they wanted to work elsewhere.) This means that teachers are getting something which directly impacts on their classes. We have also increased the number of departmental meetings so teachers can focus on improving their pedagogical content knowledge. 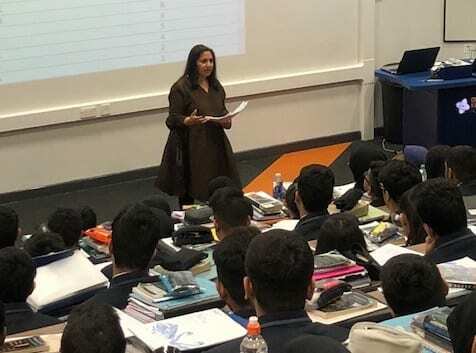 The Sutton Trust ‘What Makes Great Teaching’ report said that “the most effective teachers have deep knowledge of the subjects they teach”, and we place high value on teachers getting better at teaching their subject. While it is useful to improve in more general aspects of teaching, we can’t do a whole staff training session on how best to teach Shakespeare, which is what an English teacher might need. (Well, I will if the principal lets me). In this post on subject-specific practice, I wrote about how MFL used their meeting to practice speaking in the target language. It isn’t easy to get CPD right for everyone, and we won’t always manage it, but the pace of improvement when you build a school culture around individual teacher development is incredible. One of the best things about my job is that I get to see lots of other people teaching, and this week I noticed a common thread in lessons that allowed me to reflect on my questioning, and then, in a roundabout way, on my teaching of writing. In particular, I saw No Opt Out, a technique taken from Teach Like a Champion, used expertly in several lessons. This is the idea that when a student says “I don’t know”, you stay with them until they get it, or give various cues to support, or ask another student before returning to them. As Lemov writes: “In the end, there’s far less incentive to refuse to try if doing so doesn’t save you any work, so No Opt Out’s attribute of causing students to answer a question they’ve attempted to avoid is a key lever.” It’s something that we practised in CPD last year and it was great to see it being used in lessons. Yet there are some very real problems that can occur when this is used. Momentum can be lost when you stick with a student, especially when the question might just be a quick check that forms part of an explanation. It can mean that others in the class switch off, which is not great, especially when the strategy is designed to eliminate this kind of thing. I felt a little of this ‘switching off’ in one of my own lessons this week. So why did this lead me to think about writing? Well, by coincidence I have been teaching redrafting, which is another method which we can make obsolete after a while. 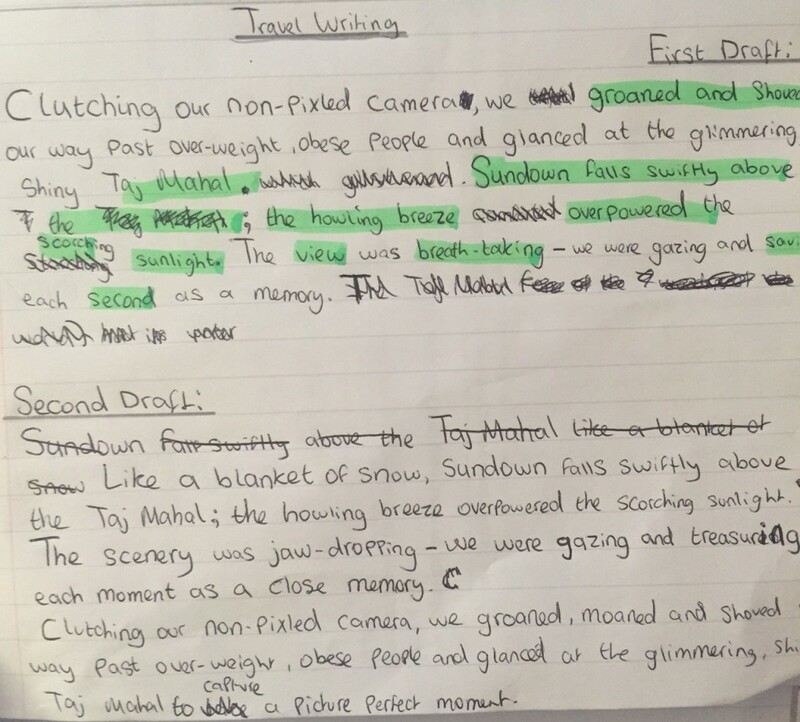 When we explicitly teach it well, we can get to a point where we rarely have to do redrafting. Once students have the habits effective in redrafting, they can become proficient in revising work, editing things as they write. I have been using Kelly Gallagher’s STAR Revision mnemonic (which I think is one of the few useful ones in English) to model this. You can read more about this in Revision Before Redrafting. It takes work to build these habits, but once students know how to do it, they can do it in their head, they can do it mid sentence, they can reorder sentences in paragraphs as they write. You barely have to teach it again. Here are some examples of how this works, taken from one of my classes this week. In the first example, the task was to redraft the opening. You can see lots of changes, with perhaps the most interesting one that it now starts with a simile. 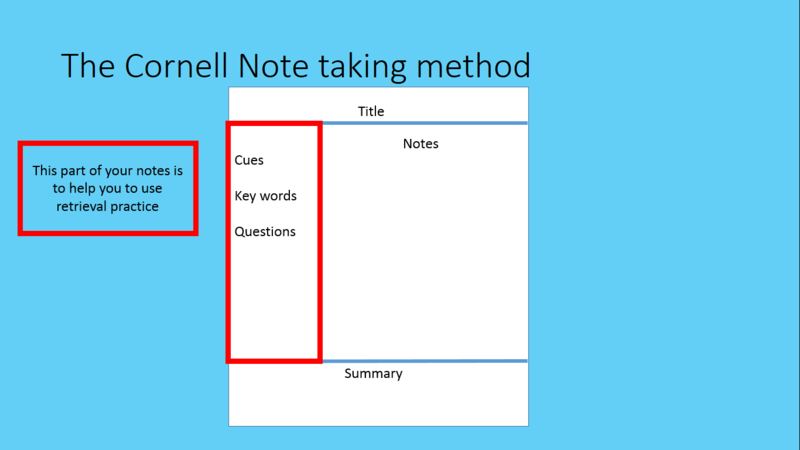 In the next example, a different student is now consciously revising as they write. 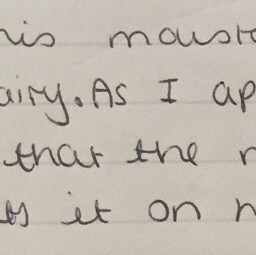 This was the very next lesson after the explicit teaching of redrafting. You can see them change their mind halfway through ‘beautifully’ and constantly revise their writing. Is it perfect? Not yet. But it is almost a second draft without writing the first. The final example has just one word changed. The man holds a photograph on his heart rather than his stomach. I love that. Looking at the messy examples above reminds me that another keep-doing-it-so-you-don’t-have-to-do-it strategy is being fussy about presentation! Whether it is thinking, revising or using a ruler, persevering at the start means that you will rarely have to do it again. My old classroom had a suite of computers, an interactive whiteboard and a visualiser. I loved the visualiser and it was great to not have to book IT suites, but did these things transform my teaching? I’m not sure. In fact, I spent a lot of time trying out sites and doing things on computers because I could rather than I should (I still have nightmares about those ClassDojo monsters). I’m not complaining- I was very fortunate to have that classroom- but I think that the technology that is most helpful to me now as a teacher is all relatively simple. So here are three pieces of technology that make my life easier. I think this has been the most useful piece of technology I have ever purchased. 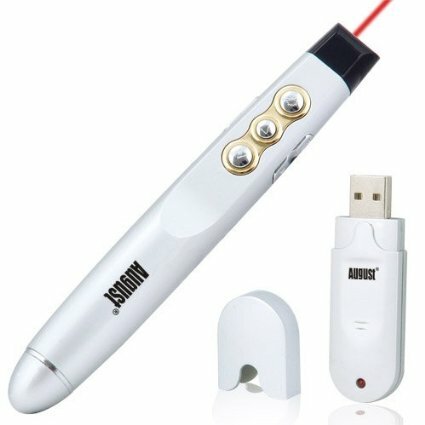 It has a couple of very simple functions: it clicks slides back and forward; it has a laser pointer. The greatest benefit is that I can move around the classroom when I’m teaching- I’m never stuck behind my laptop. If, when circulating, I need to revisit something with a student, I can click back through slides. Simple but really useful. It was recommended to me by @amsammons and is available here for £7.25. 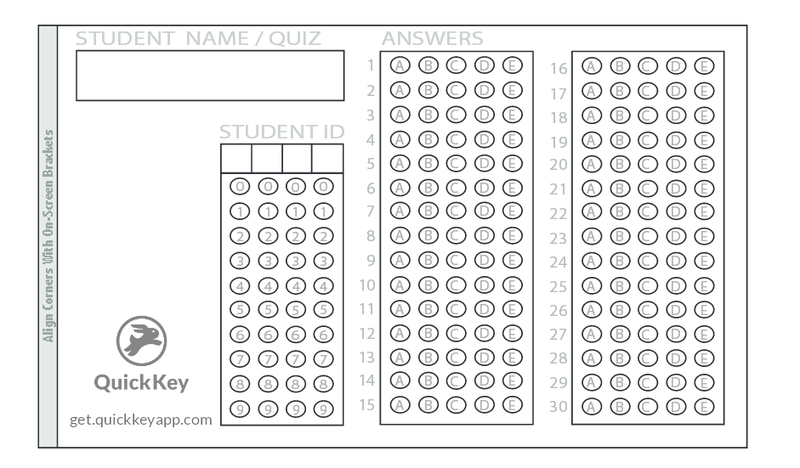 Quick Key is an app which scans multiple choice quizzes. Results can be broken down by student and by question on the app. You can then export the data in various forms from the website for further analysis. It’s easiest to illustrate the benefits with an example, in this case a quick homophone activity I used with a class. The first 5 questions had options of your/ you’re and the next five were there/their/they’re. 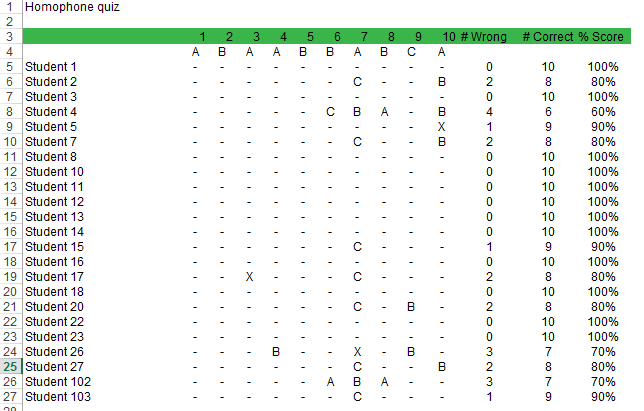 I scanned it in and then exported the data in question level analysis form, which looked like this. Where there is an X, the question was not answered. If there is a letter, then that indicates that they were wrong and they chose that option. With the exception of one student on one question, it is clear that the class coped well with your/ you’re. The X in this case was actually a correct answer which just didn’t scan properly. Questions 7 and 10 were answered poorly, particularly Q7. Both of these required ‘there’ as an answer, yet students generally went for ‘they’re’ for Q7 and ‘their’ for Q10. Q7: ___________________ are nearly 65 million people in Great Britain. The three students who struggled the most with homophones were given additional exercises during class and I also spent some more time teaching them the differences. The class were then given an extended quiz on there/they’re/their just to make sure that guessing was less likely to be a factor in success. We looked together at the specific examples, addressing why they may have used the wrong one. The first one looked to be that the word ‘are’ had confused them but I was surprised with the errors on Q10. 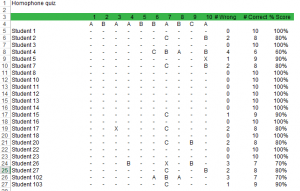 It’s so useful to have this kind of precise individual and question level data, which can be immediately acted upon. One of my colleagues sets Quick Key quizzes as a Do Now activity, marks them straight away and then provides follow up activities and reteaching where necessary within the same lesson. 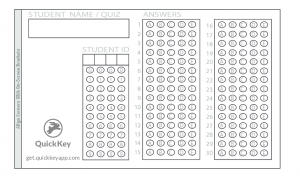 With well designed multiple choice questions, Quick Key is an incredibly effective tool. It costs around £20* for the annual Pro subscription. I’d recommend this as the free one does much less and you can have a free month’s trial if necessary. It’s not without frustrations. Students will find all sorts of ways to fill the forms in incorrectly and you need to avoid bright lights when scanning. You can always manually enter the answers as a last resort. I think we could do well by talking more about organisation and productivity for teachers. I am envious of those people for whom organisation seems to come naturally so I have tried to improve my productivity in the same way that I might try to improve my questioning or my feedback. I read a number of stories about how Evernote had transformed the way people work, had a look at what the fuss was about and am now a convert. Evernote is an app for creating, organising and storing various forms of media. It’s versatile and can be accessed on different devices and synced between them. If someone grabs me on the corridor and asks me to do something, I can record it immediately. I can clip pages I want read to view later. I can forward emails there. I can make checklists and tag in a way that keeps me organised. I can set alarms, store documents I will need, add images, record voice reminders. By capturing things in an organised, searchable place, I don’t have to hold things in my head or fill endless notebooks. When things need doing, they are there. I don’t think Evernote would be nearly as effective without an organised system. I use a variation of the ‘Secret Weapon’ method which you can read about here. Without this- and the excellent advice in Getting Things Done– Evernote could just be a messy electronic version of a notebook. As with Quick Key, there’s a free and a premium version. 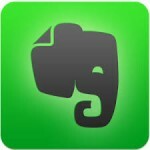 The free version is pretty good with Evernote. A final point. All of these are things that I’ve been using for a significant period of time, not merely weeks or months. I filed this blog away for many months to ensure that I wasn’t just talking about the latest fads (which is why Plickers is not on here). These might be just what you need, but they might not be. If you have read Teach Like a Champion 2.0, you’ll be familiar with ‘The Art of the Sentence’. 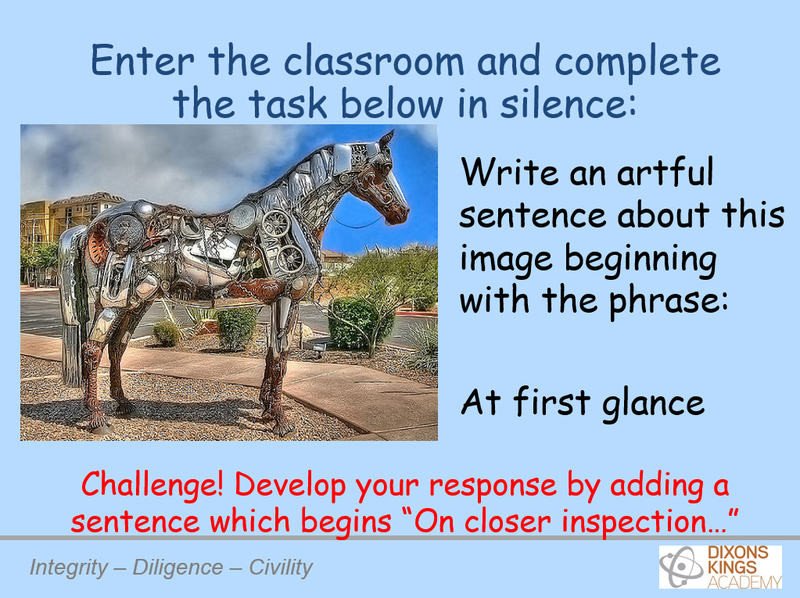 Ask students to synthesize a complex idea in a single, well-crafted sentence. The discipline of having to make one sentence do all the work pushes students to use new syntactical forms. Sentences are the simplest mentor texts and students with a command of effective sentence-building tend to produce the best writing. At my school, Dixons Kings Academy, we’ve been starting every lesson with The Art of the Sentence. It’s a simple strategy with a massive impact. 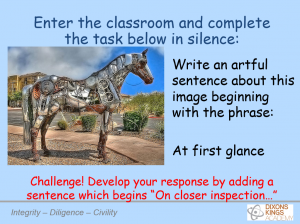 This construction enables-or forces- students to think in a specific way about the text. As students are presented with more and more of these sentence constructions, they will reach for just the right one when they want to think precisely about a concept. We asked staff to reflect on the habits of thinking we needed to develop in our students and then designed sentences to promote this. For example, in many subjects there is a need to consider and then express cause and effect. Which sentences might help students to develop this habit of thinking? As a result of_______________, ______________________. 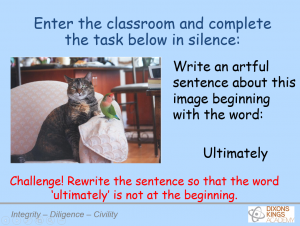 Every lesson starts with an artful sentence. 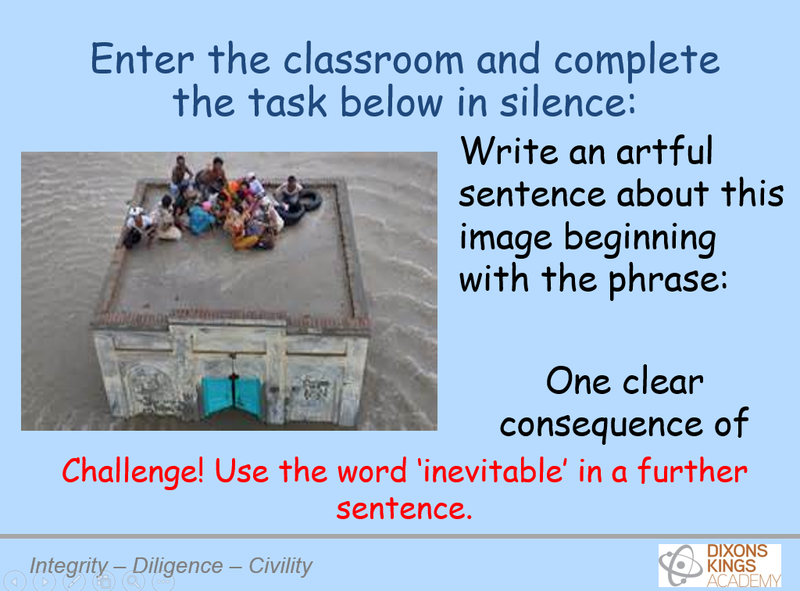 While the sequence can be extended and sentences studied- as I do repeatedly- this can also be completed quickly at the start and the simple routine makes lesson starts more purposeful. I use mini whiteboards, some teachers use computers, some books and some just ask students to think of their response. The immediate habits of thinking and working set the tone for the rest of the lesson: no minute is wasted in the pursuit of learning. Teachers then transition into the teaching of the subject. Our Director of Literacy took on the mammoth task of creating slides, trawling the internet for interesting and unusual images to use, and designing just the right sentences. Initially, there were small issues that needed addressing. Some students were using the sentences without the precise meaning. 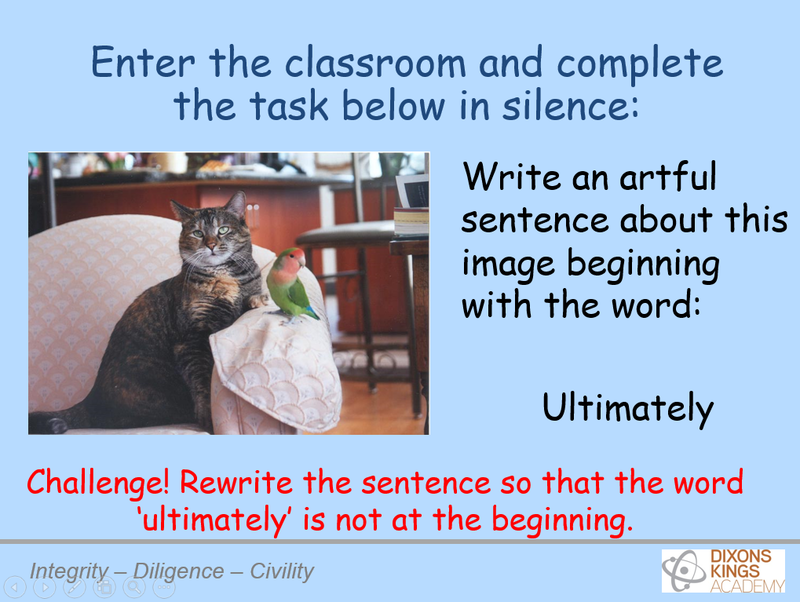 For example, one student in my class wrote, “Ultimately, there is a cat and a bird.” This follows the instructions of the task, but with no real understanding of why we should use that word. Also, with the wrong image /sentence combination, sentences don’t really work either. “On the surface” only works if there is something deeper that is not on the surface. The first time that students encounter a word such as “inevitable”, it probably has to be explained. The second time might require another explanation but students soon get it. In one of my recent lessons, students were writing a paragraph comparing Helena from a Midsummer Night’s Dream with a typical Elizabethan woman and I saw this: “Helena differs from a typical Elizabethan woman in a number of ways respects.” This topic sentence construction had been used on a number of slides. Then, in another lesson, a student wrote: “Ultimately, Romeo is a tragic hero and is fated to die.” I hear the sentences in class discussion and see them in writing with increasing frequency. 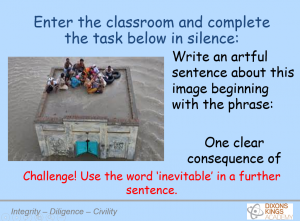 So far, we have used the same sentences across the school, but we will shift to making them more subject specific, allowing students to develop the vocabulary and precision of thought in a particular subject discipline. We will also increase the complexity of some of the sentences now that students are grasping the concept. At present, we have been constructing sentences based on images but next will be graphs, extracts from literature, historical sources. Chris Curtis’ Death to Sentence Stems! Long Live the Sentence Structures!